*Please note: This is NOT an exact replica! This is MY storybook INSPIRED by Henry's book. This is a MADE TO ORDER item. Once an order is placed I will begin working on a new book. It may take anywhere between 2-4 days to complete, or 1-2 weeks during busy seasons. This book is a completely paper medium product, (the cover is made of paper, not leather). Do you have the heart of the truest believer? Do you believe in True Love? Do you like stories with a happy ending? I am a graphic designer and I wanted to create a real story book based on the one Henry cherishes so much. 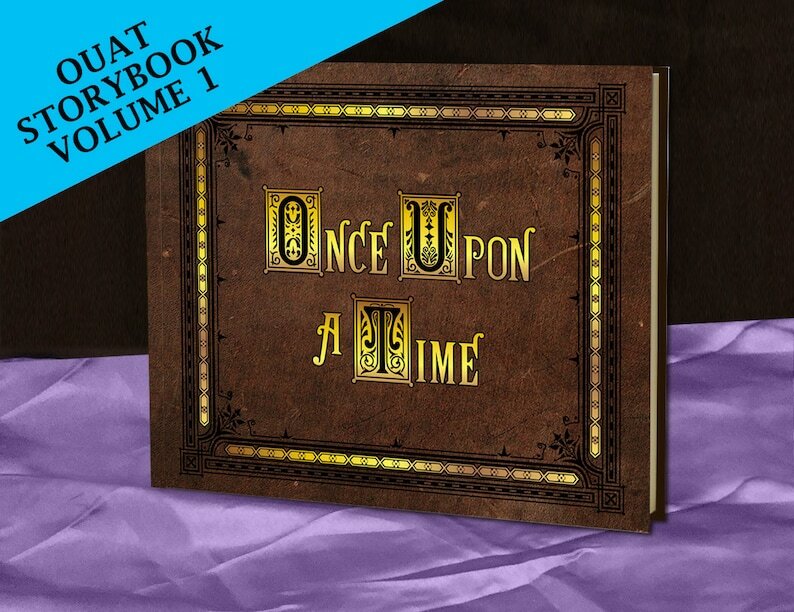 It contains the fairy tales in their original versions by The Brothers Grimm, along with images of the characters from OUAT's Enchanted Forest. It is illustrated with images from seasons 1. This is a hand-made book inspired by OUAT's story book given to young Henry Mills by Mary Margaret, aka Snow White. It is an original hand-stitched, hand-crafted storybook. This is an all paper product. The pages are hand-sewn and then glued together using a Perfect Binding method. The covers are printed on glossy paper and then wrapped around poster board. The full size 11" wide x 8.5" high; 56 pages (counted both sides). It is not as large as the one seen in the series. The inner cover pages are colored texture paper. It's a perfect prop for cosplay or a OUAT's fan gift. I thought it would have thicker pages but it was really nice it was made with care. Jenny was super helpful, she answered my questions very quickly. I received the book just four days after ordering and that included a personalized dedication page. Can’t wait to give this as a Christmas gift. Totally thrilled with my purchase. Outstanding quality! Danke für das Buch, habe es am Montag den 14.08.2017 erhalten. Es wird am 28.08. für einen Geburtstag verwendet. I only accept Paypal or Etsy Direct Checkout payments at this time. Please note that any custom orders cannot be canceled once the custom item is produced. Items can be returned for a refund for up to 30 days. Refunds will be issued once I have received the undamaged item(s). If you are returning an item, please try to wrap it as carefully as it was shipped out. Damaged items cannot be refunded. Custom orders cannot be refunded. Refunds include the price of the order and the original shipping fee. Ready to ship items will be sent out within 1-2 business days. Made-to-order items can take up to 1-2 weeks, or longer if it's a busy season. Please message me for specific times when purchasing made to order items. My production time varies from week to week based upon how many orders I have. I generally work on orders on a first come first serve basis, but I can shift things around for rush orders when possible. I ship via USPS. Once shipped, items can take 2-5 business days in transit for domestic orders. International shipping can take anywhere between 7-15 business days or longer. I cannot guarantee shipping times for overseas orders. Please understand that items can get held up in customs for weeks and that this is beyond my control.